Flexographic Printing often abbreviated “Flexo” is the printing process which utilizes flexible relief plates for each color printed. 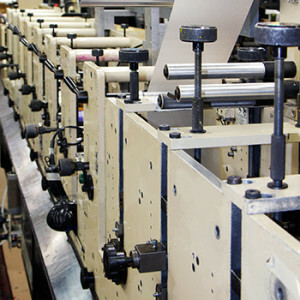 Flexo presses have a longer set-up time than digital presses but has a faster output once it’s up and running. Our flexo presses can run up to 12 independent colors, varnishes and foil stamping in one printing run. Labels and shrink sleeves print fast, which makes this process best suited and the least expensive cost per in larger quantities. 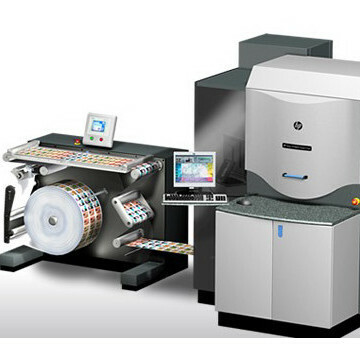 Digital Printing is new technology and a popular choice for many industries. Digital technology allows printing of multiple “versions”, of visual designs, consecutive numbers and bar-codes with variable data technology. Digital presses have fewer technical requirements than flexographic because no printing plates are used so smaller quantities makes financial sense on a cost per label and sleeve. Perfect for smaller runs or to test new products, designs. Fast Delivery – Orders are delivered within 48 hours after artwork approval. Personal On-Site Service – We visit you in Fort Lauderdale, Boca Raton, Miami or anywhere in South Florida. New Laser Technology – Create any shape label with a zero die cost to you. Label Materials – From no-look clear labels to films, foils and papers, we only source the best materials. Experience – Over 20 years in the label, screen print and visual design business. Price – We guarantee competitive pricing on all our services and best of all, We Care! Made in USA – All labels and screen printing is produced in the USA. Decorative Screen Printing is an old world process when orders are under 10,000 for a specific container size. Each container is cleaned, placed by hand in a custom fixture based on the type of container and screen printed one color at a time. 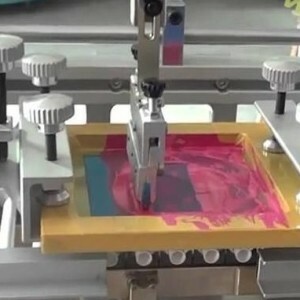 After the color has been screen on the container, it passes trough a dryer to cure the ink. You can also add decorative foil with an additional pass. Sounds like this will take forever…but we have been doing this for over 20 years. Preferred by the health and beauty industry. Decorative screen printing on bottles and jars gives your product the look of elegance. The simple yet sophisticated look direct screen printing over labeling takes your product to the next level. Screen printing allows faster turn-around time after artwork approval , inks produce a permanent finish that will not scratch or fade and will produce superior clarity of even the smallest text. No labeling needed, small quantities and unique container options are some of the advantages. The decorative silkscreen process allows you the luxury of the no-label look, giving your product the edge when directly printed on glass, acrylic or plastic containers. We work with several local container manufacturers and can help you with the selection of jars, closures, bottles and squeezable tubes of varying shapes, sizes and materials. Design starts by choosing the right container so your final product delivers a classic high-end look. Many of our customers see the benefit of including us when selecting the proper Airless Pump, Squeezable Tube, Jars and Closures prior to creating the printed design. We can help with the entire process. Blue Line Labels delivers a professional final product on time. Our 20 years of art, design and print experience will assure you of an excellent relationship at a cost effective price. Come for a visit! Our label showroom is located in Margate, Florida and is 15 minutes from Boca Raton, Fort Lauderdale, Pompano Beach and Coral Springs. Call us at 1-800-609-7079 to discuss your next project.